This size is probably the most popular bed size in the UK. An a great size double that has enough room for couples but doesn't dominate a small room or take up to much space in the bedroom. We make superior fitted sheets for double beds. 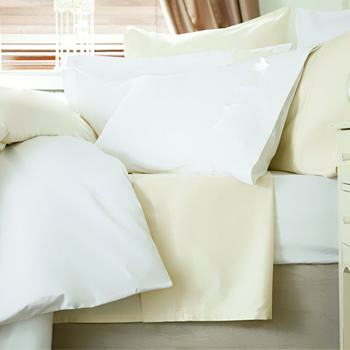 Our sheets are made with french corners and elastic hem for durability and ease of use. Double Fitted Sheet in 100% CottonFine 200 threads to the inch fitted sheet in natural 100% CottonMa.. Double Fitted Sheet in 100% Cotton 400 Thread Count - 4'6" x 6'3"
Double Fitted Sheet in 100% Cotton400 Thread count fitted sheet in 100% CottonMade to fit 137 x 191c.. Double Fitted Sheet in 100% Cotton FlanneletteRelax in super soft 175gsm fitted sheet in 100% Brushe.. Double Fitted Sheet in 100% Egyptian CottonTightly packed yarns of beautiful Egyptian Cotton.Fine 20.. Double Fitted Sheet in 100% Mulberry SilkSuperior 100% Mulberry Silk fitted sheet.Luxury Fitted shee.. Double Fitted Sheet in 1200 Thread Count Cotton - 2 colours - 4'6" x 6'3"
Double Fitted Sheet in 1200 thread countSuperior 1200 thread count fitted sheet in 100% CottonLuxury.. Double Satin Stripe Fitted Sheet200 Thread Count Cotton sheet in stylish satin stripe100% Cotton, Av.. Double Fitted Sheet in 540TC Satin Stripe Cotton - 4 colours - 4'6" x 6'3"
Double Fitted Sheet in Satin Stripe in 4 ColoursLuxury 540 thread count fitted sheet in Egyptian Cot..
UK Double Fitted Sheet in Poly Cotton - 11 ColoursFitted sheets to fit 4ft 6" x 6ft 3", 137 x 191cm&.. Extra Deep Double Fitted Sheet in 100% Egyptian CottonTightly packed yarns of beautiful Egyptian Cot..